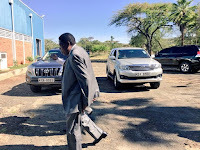 Tuesday August 28, 2018 - Devolution Cabinet Secretary, Eugene Wamalwa, has poked holes into the recent approach adopted by the no-nonsense duo of Director of Public Prosecutions (DPP) Noordin Haji and DCI boss, George Kinoti, of arresting suspects on Fridays and throwing them in police cells as they await processing. Speaking in Makueni County yesterday during the start of a Governors’ peer-to-peer conference, Wamalwa warned the duo to follow the due process and stop arresting people anyhow. “But I want to caution that this war will not be won by the drama we see with the Friday night arrests and the dramatic opinion polls," said Wamalwa. Wamalwa urged Kenyans to unite in slaying the ghost of corruption. “It's through reviewing our religious values and those of our children that we will be able to win the war on corruption," he added.